Grace Christian Homeschool: CC Cycle 1 Lapbooks are finished and ready! We purchased our first lapbooks for Classical Conversations Cycle 3 last year. We have never used lapbooks before but these were so fun to do!! 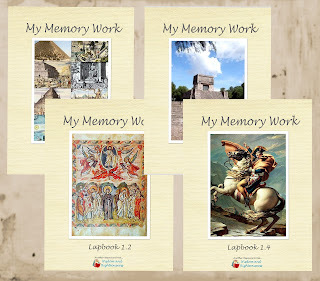 I always thought they were too time consuming to even attempt but my children loved putting their own "memory work book" aka lapbook together for review. Karen at Wisdom and Righteousness has done it again for Cycle 1. She has just completed them and they are even more beautiful than the first set. You can purchase each quarter individually for $9.95 each or purchase all 4 for $29.95 here. She is also giving away 2 lapbooks here! Contest ends May 21, 2012.